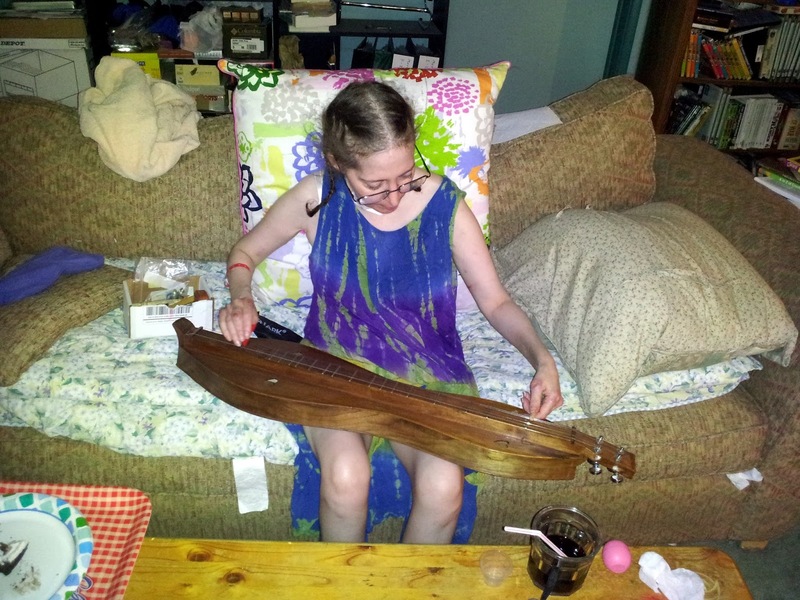 The mountain dulcimer is one of the most disabled-friendly stringed instruments around, especially if you play it with a noter. It also teaches you to separate your arm actions (which is still a work in progress for me). But most of all, it's a lot more fun than pulling your arms behind your body until you say uncle! That's a slightly exaggerated version of some real shoulder exercises I was given. I think they're supposed to improve range of motion. Either that or it prepares you for entering a life of crime. When I came home from the nursing home, standing up repeatedly was one of my assigned physical therapy exercises, as well. It was as if I were attending a legendary performer's farewell concert. It's still hard for me to believe that something so simple could've become so difficult. I spent every ounce of energy I had on my physical therapy and just trying to do the bare minimum of what was necessary for living outside a 24-hour care facility. You know, like walking to the bathroom. So, playing the dulcimer was out of the question. But as I grew stronger, I began to play again. Joella had to put the dulcimer at the end of the couch for me so that I only had to carry it a few feet before plopping down on the couch. I held onto my walker so I wouldn't smash the dulcimer into splinters. I could play only a half hour at most. But the length of time slowly increased. At first, it felt almost as if I was learning to play all over again. My timing was way off. I thought I had just grown rusty, but I eventually realized that my body simply didn't have the coordination it did before the strokes and coma. Before the coma, I had been doing a simple form of fingerpicking based on Travis picking that I learned from Jennifer Ranger at the Harvest Festival of Dulcimers. But when my fingers tried a simple roll, they tripped up. It was like trying to crawl on a layer of greased ball bearings. I simply couldn't get them to pluck the strings in sequence consistently. And my fingers cramped up and grew tired within minutes. They soon began coordinating better, however. And as they did, my general hand dexterity improved. I suppose if I were a chord/melody player, the finger of my left hand would've gained more strength and nimbleness, as well. But I love noter/drone playing. While I was still in the nursing home, it seemed to me that my left hand, which had always played third fiddle to my very dominant right hand, had become the weaker one. It quickly improved, but that might have been one of the reasons why I had so much trouble fingerpicking at first. I've come to realize that, contrary to what my neurologist once thought, my weakness was not solely due inactivity during my six-week coma. I've experienced uneven patches of lost strength (not that I had much to lose in the first place), due to my string-of-pearls stroke damage. If you saw my MRI, you would know why it's called that. 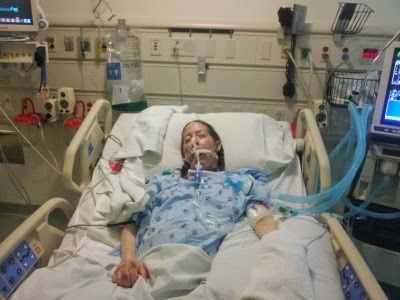 Unlike most stroke victims, I had strokes on both sides of my brain, since it was caused by oxygen-deprivation from plummeting blood pressure, not blood clots or burst vessels. But even recuperation isn't as strong a motivator as getting lost in an activity you enjoy. I can be extremely single-minded when I'm concentrating on something; it's related to my ADHD. When I'm learning a new song or technique, I often play far longer than I had intended. That was unwise when I was in the active phase of dermatomyositis, because exercise can actually exacerbate the muscle damage. 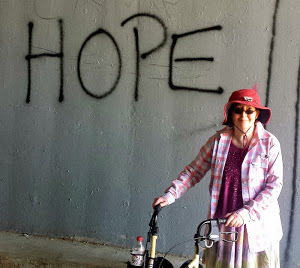 But during my stroke and coma recovery, that hyperfocusing contributed to my muscle strengthening and improved coordination, as I played until thoroughly exhausted. That's something I was unlikely to do when I was doing boring physical therapy exercises, as important as they were. And my dulcimer physical therapy still continues. For Valentine's Day, Keith gave me a set of foot and ankle percussion instruments. They're meant to accompany your playing when you tap your feet. He gave me a foot tambourine, wooden ankle rattles, and a foot shaker (though I prefer the one that goes on my finger because it perfectly matches my strumming rhythm). I'm currently practicing tapping my right foot to strengthen it because I have difficulty keeping up the tapping throughout songs. My right leg is my weaker one due to that uneven stroke damage, but I'm still strongly right-footed. This tapping practice is already improving my rhythm, and it should have the added benefit of strengthening my weaker foot in the bargain. And, again, I'm doing it more than I ever would a physical therapy exercise because it's fun. Before I was banned from Friends of the Mountain Dulcimer for talking too much about my illnesses (yes, really! ), a friend posted a pic of similar billboard to this one. 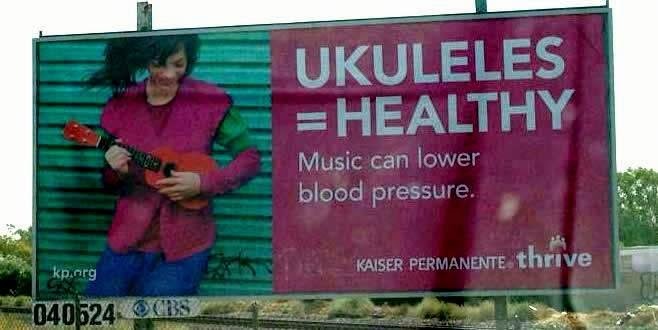 Stringed instruments had fewer side-effect, too! I'm a member of Kaiser. 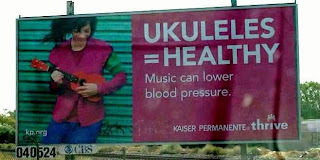 Do you think they might consider handing out dulcimers instead of pills?